The FTPUSE command maps a remote share (FTP server) as a local drive, so you can use the FTP server of your choice as a local hard drive. 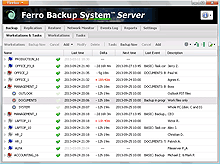 FTPUSE is a free application which was developed during production of the endpoint backup solution Ferro Backup System, but disks mapped using FTPUSE can be accessed by any application (e.g. Windows Explorer, Total Commander, MS-DOS command shell). Please note that we don't offer technical support for free products. Are You a System or Network Administrator? Deletes the established connection with the FTP Server. FTPUSE needs drivers, and so it is distributed as an installation package. The installer includes DOKAN file system drivers and the FTPUSE application. FTPUSE runs under: Windows XP, Windows Server 2003, Windows Vista, Windows Server 2008, Windows 7, Windows Server 2008, Windows 8, Windows Server 2012, Windows 10; x64 or x86. FTPUSE uses the DOKAN file system driver created by Hiroki Asakawa. It is similar in operation to the CurlFtp command present in Linux, which uses the FUSE driver. FTP USE can complement the NET USE command, which can be used to map network resources but does not support FTP. © 2015 FERRO Software. All rights reserved.